I know what you are thinking… not another cauliflower mashed potato recipe, again?!?! No! It’s not like that. This has real potatoes and cauliflower all-in-one dish. 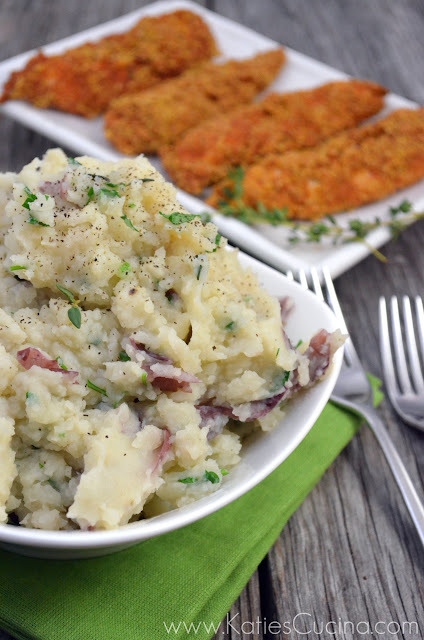 This lighter version of real mashed potatoes accompanied my super tasty crunchy-baked chicken strips. I watched my husband take a giant bite, and then noticed the puzzled look on his face. He then proceeded to take a few more bites of the mashed potatoes and cauliflower. I then finally spoke up (I felt bad leading him on) and told him that I incorporated some cauliflower into the mashed potatoes. He was like “oh that’s why they are super light and fluffy–they are great”. I was expecting him to complain that there was no gravy for the potatoes and that maybe they were lacking flavor since they weren’t full of butter and heavy cream. I was pleasantly surprised and as I began enjoying each blissful bite I realized that this is the way to go. Our dinner conversation also got really interesting. We both agreed that this is the perfect way to hide vegetables for any non-veggie eater like children. Then all of a sudden my husband’s business-like mind started racing and within minutes he was telling me how I should write a cookbook on how to trick kids into eating foods that are full of healthy foods. I told him that there are already a few books on the market and thanked him for his “brilliant” idea. 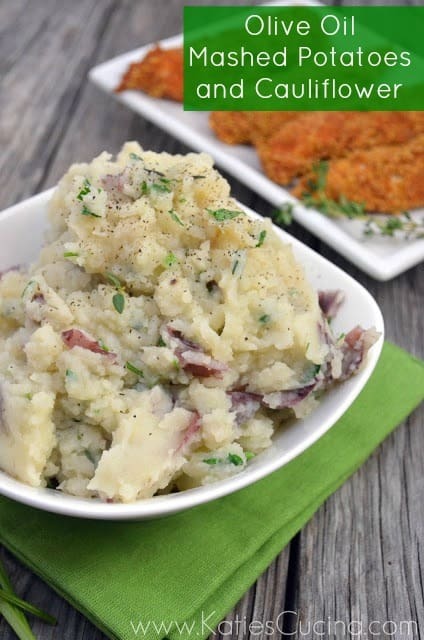 So you get the idea… whether you are trying to hide veggies from you kids or maybe your picky non-veggie eating husband or just want to lighten-up your mashed potatoes give this recipe a try! I’m not going to lie… I did have to resist the urge to put a pat of butter on my potatoes. With or without the butter they are still delicious! In a large pot add 3 cups of quartered red baby potatoes and fill with water, three quarters of the pot full. Add 1 tsp salt to the water. Bring to a boil and cook for 15 minutes. Then add cauliflower to the same pot and cook for an additional 10 minutes or until potatoes and cauliflower are fork tender. Drain and place back in the pot. Add olive oil, chopped herbs, garlic powder, salt, and pepper. Blend until smooth using a hand mixer. Taste to see if you prefer more salt and pepper. Add more if desired. Serve and enjoy! *All stove tops cook differently. Cook this recipe like you would normally cook potatoes. If your stove top cooks faster than what was written above then adjust your cooking times. Great idea! I have made one or the other but I love the fusion of them both together!